Video Storytelling & Your Business with Cosmic Sauce – REDI | Regional Economic Development Inc. Learn how to craft videos that move audiences to action! 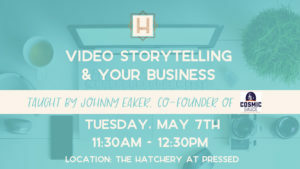 In this 1 hour workshop attendees will learn why storytelling is such an important part of any business’ marketing plan and why video is the most effective medium. You will learn about the 5 most effective types of videos you should be making to move your audiences to action and in turn generating results for your business. Attendees may need paper and pen to take notes. Cosmic Sauce is a video marketing agency that helps businesses tell their story through video. Teaching them how to execute, and distribute video content in a way that gets measurable results. As the co-founder of Cosmic Sauce, Johnny brings tremendous experience in video strategy and distribution. Prior to helping found the agency, he was a video director at a Fortune 50 company, where he worked with high-profile partners like the NBA, helped lead national campaigns, and helped grow the brand’s social media presence to over 2 million followers.